The West is teetering on the edge of a world war right now. Whether it is another Cold War like the one that lasted from 1945 to 1991 and can be theoretically considered to be World War III, or a series of running skirmishes will be determined in the coming year. WWIV will not be a battle between nation states, such as WWI, WWII and the Cold War, but a war involving various factions within the nation states themselves in North America and Western Europe. It will be a world war between those who believe in nationalism, populism and freedom vs. leftists and anarchists who stand for Big Brother, open borders/national suicide, cultural decay and the destruction of free speech. President Trump is without a doubt not only the leader of a populist movement in the United States, but the de facto spokesman for anyone who believes in liberty and denounces the evil and slavery of globalism across the world. Trump is now the number one target of the global elite, the Deep State, the DC establishment and the corporate liberal media. In the United Kingdom, Nigel Farage is a modern day Braveheart, taking on the Big Brother tyranny of the European Union and the globalist elite planted firmly in the British government at all levels. It was Farage’s magnetic personality and unbridled determination that motivated Britons to vote for Brexit and to deal a death blow to the EU and its octopus stranglehold on the UK. 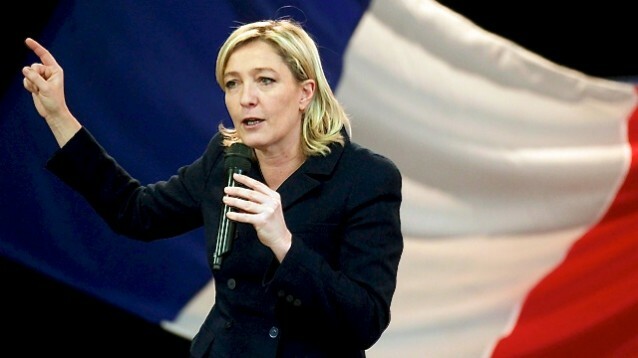 Marie Le Pen’s National Front is the populist reaction to the insanity of unlimited Muslim immigration into Western Europe and France and the subsequent meek reaction by the Hollande government to the continuous onslaught of radical Islamic terrorism. If Le Pen wins, the EU is doomed. Pray for Le Pen. Pray for the death of the EU and every facet of bureaucratic tyranny and globalism it represents. Vive la Liberte. The global and political elite are determined to destroy America and the West, through their policies of open borders, outsourced economies, world government and lunatic political correctness as a defense against violent Islamic extremism. In order for the global elite to win, Mr. Trump and everything he stands for must be destroyed. The globalists’ current strategy to annihilate President Trump is a ‘death by a thousand cuts.’ Mr. Trump must be impeached or taken down through a constant series of political machinations, media fabrications and Soviet style maskirovka disinformation from Deep State traitors within the intelligence community. If that doesn’t work, the globalists may even attempt a violent coup d’etat, as they successfully did on November 22, 1963. The willing executioners of the globalists are the myriad of liberal politicians across the Northern Hemisphere. In the US, the Democrats are completely unhinged and with an army of ideological zealots and funding from billionaire, George Soros, they will continue to attack the President, malign his leadership and most certainly attempt to impeach him. In Sweden and Germany, governments completely ignore the cries from their citizens to stem the tide of unvetted, unlimited Muslim immigration. Furthermore, the Swedish and German governments continue to cover up crimes committed by Muslim migrants and most disturbingly prosecute Swedish and German citizens who seek to tell the truth about the dangers of Islam in Europe. At their disposal, the globalists have an array of delusional snowflakes, radical anarchists, militant feminists, Marxists and violent agitators to utilize at a moment’s notice. Groups like BLM, CAIR, La Raza and Indivisible, the group responsible for causing chaos at GOP town halls are all on the payroll of George Soros. The agitprop arm of the Democrats and liberal governments worldwide is the globalist, corporatist mainstream media, which is working hand in glove with politicians, Marxist agitators and radical terrorist groups like Black Lives Matter to take down Mr. Trump, Mr. Farage and Mrs. Le Pen. CNN, the BBC, ZDF in Germany and ORF in Austria are not just the opposition; they have become the enemy of everyone who believes in national sovereignty. The puppets of the global elite are scattered across the world: Trudeau in Canada, Holland in France, Merkel in Germany and her probable successor from the alt-left SPD (Socialist Party of Germany), Martin Schultz. Schultz is so far to the left, he makes Merkel look like the reincarnation of John Birch. Where is all the unhinged emotion and violence of the left in the USA heading? What is the complete disregard for the safety of its own citizens in Sweden and Germany and France brewing? In the US, it is only a matter of time before violent anarchists backed by Soros battle on college campuses, at town halls and in the streets with right wing patriots, bikers and vets who have simply had enough of left wing vandalism, assaults on Trump supporters and the crushing of free speech. In the US it is only a matter of time before BLM thugs are in a full on war with America’s police. In the US, it is only a matter of time before pro illegal immigration activists are in street melees with Americans who only desire that those who wish to come here, do so legally. In Europe, it is only a matter of time before irate populations in Sweden, Germany and France finally rise up against the politically correct liberals destroying their lives and the Muslim criminals and terrorists who have turned what once were some of the safest places on earth into Third World war zones. It is only a matter of time before the forces of nationalism and globalism clash. The chances for a Cold War solution are minimal at best. The left is unhinged. Muslim crime in Europe is out of control. Politically correct politicians are intent on continuing open borders policies regardless of the consequences. The globalists will not stop until the ashes of their twisted ideology are scattered to the far corners of this planet. It is simply a matter of physics. For every action, there is a reaction. The right’s reaction is coming. It’s going to take more than elections to stop these Fascist Progressives from seizing power. Prague, 1948 is their model. The whole mess stinks of Weimar Germany, the period of civil strife that led to the second half of the Modern 30 Years War in Europe. The first half was WWI and the second WWII. Real violence and death are coming to US colleges and streets, the attacks on Trumps supporters are REAL and becoming more dangerous. The next freak’n war is to be WWIII. You sound like idiots calling it IV. We are not stupid as u would like us to be. Now I won’t read your article here because your credibility just went flying out the window. The Cold War was WWIII as mentioned in the article you moron. “Anarchists stand for Big Brother”?? This is the silliest article I’ve seen in awhile. Pure Hogshit! WWIII highlighted here, the Cold War was very real.